National Park is located along the middle-lower course of the Krka River in central Dalmatia, just a few kilometers northeast of the city of Šibenik and 76 km from Zadar. 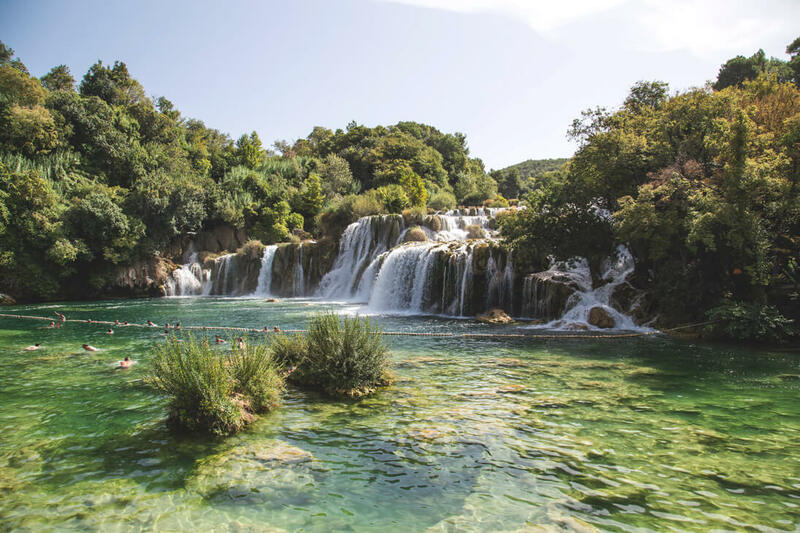 Krka is a spectacular natural phenomenon best known for its waterfalls, but there is a there is a lot more things to do and see to Krka National Park. Here is the list of most popular sites and attractions of Krka National Park. Skradinski Buk, final and the longest travertine barrier on the Krka River is one of the most popular natural attractions in Croatia and a key attraction of Krka National Park. It is surrounded by boardwalks for easy access and is a key attraction of the Park. You can even swim at Skradinski Buk, depending on the weather conditions and the level of water. Visovac Island is among Croatia’s most valuable natural and cultural values. 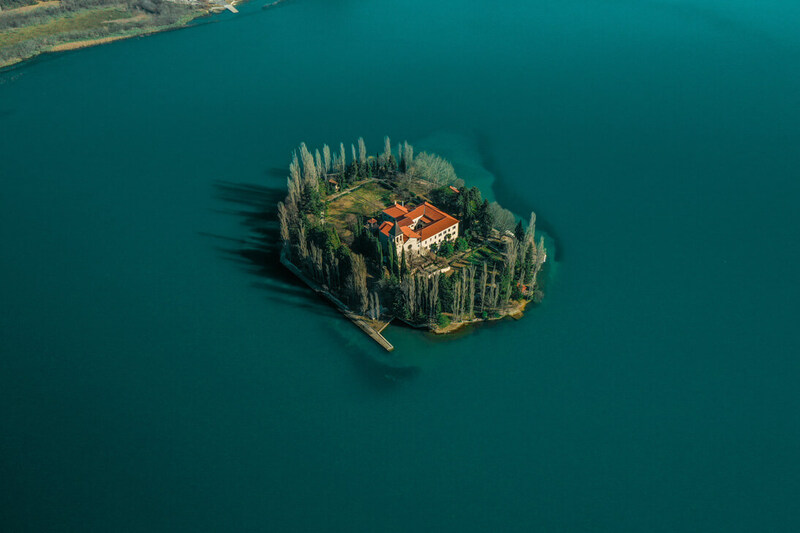 The Franciscan Monastery of Our Lady of Mercy, and the Church of Our Lady of Visovac, have stood on this little islet since 1445. Roški slap is also called the ‘vast waterfall’, and is made up of a 22.5 m high main waterfall and countless backwaters, cascades and travertine islands. Over the waterfall, there is a road that dates back to Roman times. The best way to truly experience Krka and all of its natural beauties is on foot. There are three circular trails: Skradinski buk (1900 m), Roški Slap (1360 m) and Krka Monastery (2100 m). A walking/cycling trail also leads to Skradinski buk from the Skradin bridge (3400 m), while from Lozovac, it is possible to take a forest trail (875 m) down to the park’s longest waterfall. Oziđana pećina is a cave on a path of educational walking trail Stinice – Roški slap – Oziđana pećina, and representsa site of exceptional natural, cultural and historical significance. Krka Monastery is a Serbian Orthodox monastery dedicated to the Archangel Michael, located near the river Krka. Officially founded in 1577, the Monastery is regarded as one of the most significant centres of the Orthodox Dalmatian eparchy, seated in Šibenik. Manojlovac and Bilušića Buk waterfalls, the Roman military camp Burnum and visitor center “The Visovac house Kuželj” are among other notable attractions at Krka National park. Excursion by Romeo&Juliet is your chance to enjoy the wonderful Croatia from within. Private guide will lead you to experience intimately the waterfalls at Skradinski Buk, by foot and by boat, from up-close and from viewpoints, as well as the ethno-village and the old hydroelectric plant. Day trip to Krka includes transportation from Zadar area to Krka and back, private guide, lunch package and boat tours.